Some interview questions can trip you up if you're not prepared ahead of time. I remember the first time I was asked, "How would you describe your teaching style?" I froze up like a deer in the headlights, and mumbled something about “student centeredness,” along with a few other buzzwords I remembered from my textbooks. The school didn’t give me the job… and I don’t blame them. Having a clear, deliberate approach to teaching—an approach you can describe and defend with confidence—is a key part of being a good teacher. Still, this is a tough question isn’t it? Fortunately, there are steps you can take to be ready for this important question by the time you start landing interviews for teaching work. Getting a job interview is the last step to becoming a teacher. Your earlier steps give you plenty of chances to see the way that others teach, think about how you want to teach, and get in some practice teaching. During your teacher training, think about what makes different teachers… well… different. Then think about who you want to be as a teacher. Picture the teaching tricks and approaches that will work for you, and be able to explain why they would work for you. Also try to think of what a good teaching style looks like from the perspective of the students. As you study the principles of teaching in your textbooks and classes, think of how these principles came into play when you yourself were a K-12 student. Looking back on it, how would you describe your own teachers’ teaching styles? And what are the different teaching styles of your professors? What aspects of your current professors’ teaching would you use in your own classroom, and why? And how do your students react to you as you do your teacher training fieldwork? What do you do that “works” for your students… and what may not be working so well? This kind of critical thinking will allow you to talk about your teaching style with confidence and at length in job interviews. More importantly, it will help you become a truly excellent teacher before you even get your first job. 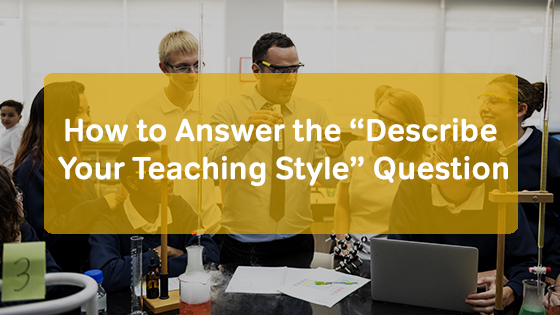 “Describe your teaching style” is an interview question you should be prepared for. So answering the question well isn’t just a matter of pedagogy knowledge and confidence in your approach. Answering the question is also a matter of salesmanship—you’re selling yourself and your teaching style to every school you interview with! So “describe your teaching style” is a question you should be asking other teachers who have already successfully interviewed for a teaching position. Ask your professors how they’d describe the way they teach, and ask the teaching style question to the classroom teachers you meet during your fieldwork. Seek out answers to this question in literature too—plenty of teachers write about their teaching styles in books, on blogs, and on online forums. And don’t be shy about reaching out to these author-teachers via email with extra questions about their teaching styles. Pay attention to what all of these other teachers say, and make note of the things that seem most convincing—the claims teachers make that really “sell” their teaching ethos. This sales angle may seem crass, but it has uses that extend far beyond the interview phase. No matter what your teaching style is, no matter how beneficial it is to your students, you will always encounter skeptics. Being able to describe the value of your teaching style to skeptical students, parents, colleagues, and administrators will allow you to overcome objections to the good work you do. If you’re able to describe your teaching style well, you’ll be able to teach the way you want to and the way you need to. And you’ll be able to convince others to try out your best practices for themselves. And don't get so caught up in preparing your answers for the interview that you don't bring along some questions that you should ask at the interview. This will help to make sure the position is a good fit for both you and the school.